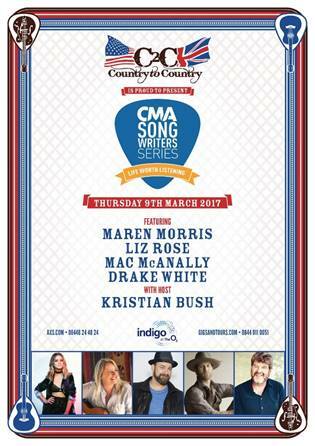 The highly anticipated line up has been now been revealed for CMA Songwriters Series on Thursday, March 9, 2017 at indigo at The O2, London. C2C and CMA are pleased to announce that CMA New Artist of the Year, Grammy Nominated artist Maren Morris, will join songwriters Liz Rose, a CMA Award winner and frequent collaborator of Taylor Swift’s, former CMA Musician of the Year Mac McAnally, and Drake White who all take to the stage, which will be hosted by five-time CMA Award winner Kristian Bush, who – among many accolades – surpassed 22 million album sales with his band Sugarland. The last remaining tickets have just been released and are available via http://www.AXS.com. Don’t Miss Out! The 26 year-old Texan singer/songwriter who is also performing on the main stage at C2C, has quickly established herself with vocal styling’s that reflect her country, folk and pop influences. Armed with sheer talent, honest lyrics and a completely magnetic presence. Morris’ album, Hero, (which includes the huge hit singles “My Church” and “80’s Mercedes”) entered the US country albums chart at No. 1. She was tied for the most nominations at “The 50th Annual CMA Awards,” including Album of the Year, Female Vocalist of the Year, Single of the Year, Song of the Year and New Artist of the Year. with George Strait, Martina McBride, Dolly Parton, Keith Whitley, George Jones, Brad Paisley, Toby Keith, Billy Joel, Trisha Yearwood, Reba …really, it’s probably easier to list who Mac hasn’t played with. His peers have voted him CMA Musician of the Year for an unprecedented eight years in a row. He’s a member of the Nashville Songwriters’ Hall of Fame and the Mississippi Musicians Hall of Fame. Hot New Country Artists to Watch and was recently chosen as one of the CRS New Faces for 2017. Major corporations have also taken notice of Drake’s talent with Geico showcasing his song “Heartbeat” in their current national television commercial featuring Dallas Cowboy’s tight end Jason Witten. Drake just kicked off his first headline dates with the SPARK TOUR 2017. He will also be take the stage at Tortuga Music Festival on April 7 in Ft. Lauderdale. GRAMMY-winning recording artist Kristian Bush has been leaving his mark on music for more than two decades. The singer, songwriter, producer and multi-instrumentalist started his career with folk-rock duo Billy Pilgrim in the early ‘90s; in 2004, he exploded onto the country music scene with Sugarland, surpassing sales of over 22 million albums worldwide, achieving five No. 1 singles and winning numerous awards, including GRAMMYs, AMAs, ACMs, CMT Music Awards and CMAs. In 2014, Bush made his solo debut with Top 20 hit “Trailer Hitch,” featured on his critically-acclaimed album SOUTHERN GRAVITY, which COUNTRY WEEKLY named the “feel-good album of the year” and ROLLING STONE named one of the Top 10 country albums of 2015. He recently wrote and performed “Forever Now,” the theme song to TLC’s hit reality series SAY YES TO THE DRESS, and his songs anchor the world premiere of TROUBADOUR, a musical set in 1950s Nashville, which debuted at Atlanta’s Alliance Theatre Center in January 2017. Currently signed to Wheelhouse/BBR Music Group, his latest single, “Sing Along,” is at radio now. For more information, visit http://www.kristianbush.com.